This tool is used to test a USB products control messaging, descriptors and basic protocol when connected to an xHCI controller. This tool takes control over the USB host controller and renders all products connected to it unusable. USB3CV should not be installed an oscilloscope or any system that uses USB as its only form of input from the user. The USB3CV tool Ver. 2.1.11.0 (April 2, 2019) is available below. NOTE 1: In order to use USB3CV, User Account Control (UAC) must be turned off. After turning off UAC, the system must be rebooted. NOTE 2: The USB3CV tool is supported on Windows 7 and above. If you have any questions, please contact ssusbcompliance@usb.org. For vendors seeking version numbers to be used at upcoming workshops please visit the compliance updates page found here. This tool is used to test a USB Hubs control messaging, descriptors and basic protocol when connected to an xHCI controller. For the definition of a USB hub please refer to the USB base specifications. This tool takes control over the USB host controller and renders all products connected to the host controller unusable. USB3CV should not be installed an oscilloscope or any system that uses USB as its only form of input from the user. The HUB3CV tool Ver. 1.3.10.0 (April 2, 2019) is available below. NOTE 1: In order to use HUB3CV, User Account Control (UAC) must be turned off. After turning off UAC, the system must be rebooted. NOTE 2 : The USB3CV tool is supported on Windows 7 and above only. SigTest is the official tool for SuperSpeed USB transmitter voltage, LFPS, and Signal Quality electrical compliance testing as well as for calibrating SuperSpeed receiver test solutions. SigTest is designed to be used with the SuperSpeed electrical test fixture available in the USB-IF eStore. SigTest version 4.0.23.2 (January 3, 2018) is available at https://www.intel.com/content/www/us/en/design/technology/high-speed-io/tools.html and should be used for USB 3.1 Gen 2 products. The SigTest tool Ver. 3.2.11.3 (April 6, 2017) is available at https://www.intel.com/content/www/us/en/design/technology/high-speed-io/tools.html and should be used for USB 3.1 Gen 1 and older. SigTest 3.2.11.3 has been updated to remove the pass/fail criteria for Rj on the 5G transmitter electrical test. This tool kit contains the Window-based HSETT utility used to initiate test modes through an xHCI controller. Detailed test procedures for high-speed host, hub and device electrical testing, tailored to common test equipment, can be downloaded here. This software provided courtesy of Intel Corporation. NOTE 1: In order to use USBHSET, User Account Control (UAC) must be turned off. After turning off UAC, the system must be rebooted. NOTE 2: The USBHSET tool works on Windows 7 and above only. Email admin@usb.org if you would like an old version of the tool that supports XP. QuadDraw is the official software for the QuadraMAX hardware, and QuadraView is the official software for viewing the results generated by a QuadraMAX. NOTE: The QuadDraw tool is supported on Windows 7 and above only. The USB-IF Compliance program uses specific USB devices and USB hubs during certification testing. Email ssusbcompliance@usb.org to get a list of these Known Good Devices and Known Good Hubs. Any questions regarding KGDs or KGHs should be directed to ssusbcompliance@usb.org. 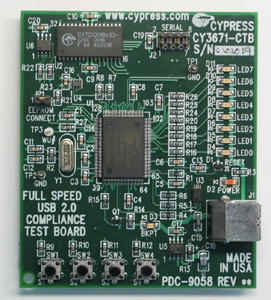 Please contact ssusbcompliance@usb.org for a list of devices used for USB PD and USB Type-C Interop Testing. Please note the equipment list is expected to change periodically as equipment models are discontinued or reach end of life. DELL XPS8700 (4th Generation Intel® Core™ i7 Processor, 8 GB Memory) and testing is performed using the on-board Intel host controller (Z87 Chipset). BIOS download at http://www.dell.com/us/p/xps-8700/pd?oc=fdcwgp1312&model_id=xps-8700. DELL XPS8920 Special Edition (7th Generation Intel® Core™ i7 Processor, 8 GB Memory). BIOS download at https://www.dell.com/support/home/us/en/04/product-support/product/xps-8920-desktop/drivers. DELL XPS8930 (8th Generation Intel® Core™ i7 Processor, 8 GB Memory). BIOS download at https://www.dell.com/support/home/us/en/19/product-support/product/xps-8930-desktop/drivers. The latest Microsoft USB driver stack is used, and is updated by running Windows Update. The BIOS should be updated to the latest version. Please follow the PDK TechGuide document (TechGuide_xHCI_SSUSB_PDK_Ver2.1) for modifications to the DELL system being used. If you have further questions about the system configuration, email ssusbcompliance@usb.org. USB-IF is using the FL1100 to test LPM L1 compliance of peripherals and hubs. The Fresco FL1100 is available for purchase at Point Grey with part number U3-PCIE2-2P01X here. This is equivalent to formerly available Fresco Logic PDK. This must be run with the Fresco driver installed, not in-box Microsoft driver. The Fresco driver version is 3.6.8.0. Included with this driver package are registry modifications that affect U1/U2 and LPM L1 operation (Fresco driver only). Run FrescoU1U2Enable-LPMEnable.reg and reboot your computer before testing with the Fresco driver to duplicate USB-IF usage. The following compliance devices are used in conjunction with compliance software to demonstrate USB hub or host compliance. These devices are not designed for use with the windows stack, and are only to be used with host and hub specific tests. Please address host or hub testing questions to ssusbcompliance@usb.org. Firmware requirements are handled through USB30CV software. This is a bus-powered device. The Low Speed Compliance Device is available through the USB-IF here. Firmware requirements are handled through USB30CV software. This is a bus-powered device.The Full Speed Compliance Device is available through the USB-IF here. https://docs.microsoft.com/en-us/windows-hardware/drivers/usbcon/microsoft-usb-test-tool--mutt--devices. Contact ssusbcompliance@usb.org with any questions. The Super Speed Compliance Device is a self-powered device that requires the compliance firmware found here (Updated 8/31/2010). The SS Compliance Device hardware is available through Lucidport.com or from Amazon.com here. Contact LucidPort Technology to purchase the Compliance Device hardware (www.lucidport.com). Download the firmware and install on the LucidPort hardware to have it operate as a compliance device. This firmware is only compatible with the Lucidport Rev2 board. During firmware update, connect a SATA drive to the hardware and follow instructions included with the firmware. After the firmware is loaded, the SS Compliance Device does not need to have a hard disk attached. To re-load original MSD firmware, attach the SATA drive again and install desired firmware. 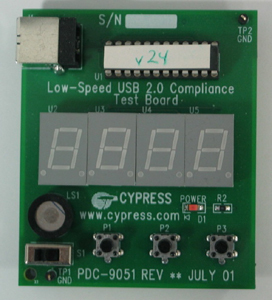 USB2.0, 3.x and Battery Charging 1.2 Drop Droop Load Board. To be used for testing the VBus Drop Droop compliance parameters of non-USB Type-C™ hosts; embedded host and hubs. Fixtures for testing USB 3.x cable assemblies and USB 3.x Connectors. This tool is intended for factory production testing and may additionally be used for pre-scan testing. Please download the Company List and save as usb.if in the same directory as USBCV. Please check the installation instructions for USBCV for details. Remember this list changes almost daily, be sure to get a fresh copy when you use the tools.